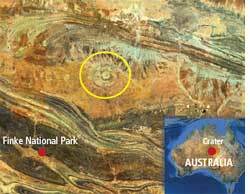 A Sydney-based astronomer has used ancient culture and modern technology to identify a meteorite crater in central Australia. Macquarie University PhD candidate Duane Hamacher has spent the past 18 months researching how aboriginal people incorporated the night sky into their culture. He says he used a story of the Arrente people and Google maps to find a crater, unknown to geologists. “This story talked about a star that fell from the sky, making a noise like thunder and crashed into a waterhole in Palm Valley,” he said. Hamacher decided to look up Google Maps and check out that area in Central Australia and see if any impact of the crater could be seen. “We propose to name it Puka after the story that we found it from,” he added.